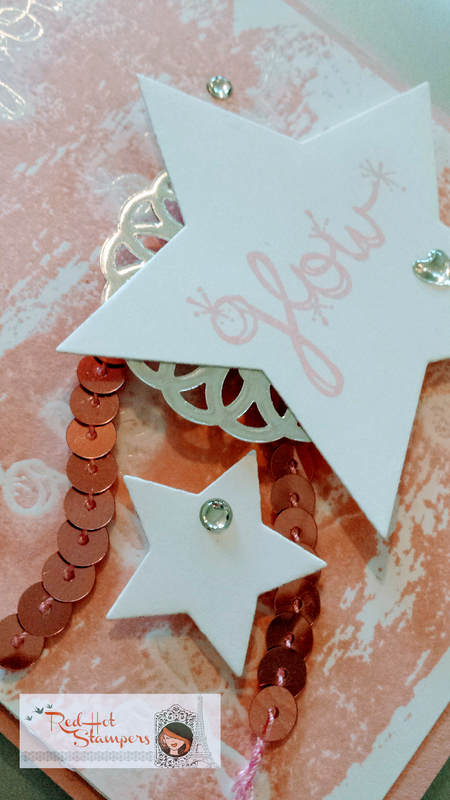 Red Hot Stampers: Let it GLOW! This Christmas, I am blessed to be able to spend some time in Europe with my family, and there's nothing more inspiring than Christmastime in Europe! Thinking of all the Christmas markets, the stained glass windows, the amazing architecture all decked out in greenery and red ribbons. Christmas is such a magical time! No matter WHERE you spend Christmas, I'm sure you'll be able to be inspired by the gold glow of white lights at night or the happy pop of colored lights cheering up a cold, bare canvas of snow! Like my facebook page & follow me on instagram for some amazing inspiration coming straight from Europe! Let me know if something I share inspires YOU! Although this card doesn't have an image of lights, the "glow" sentiment was absolutely inspired by Christmas lights! 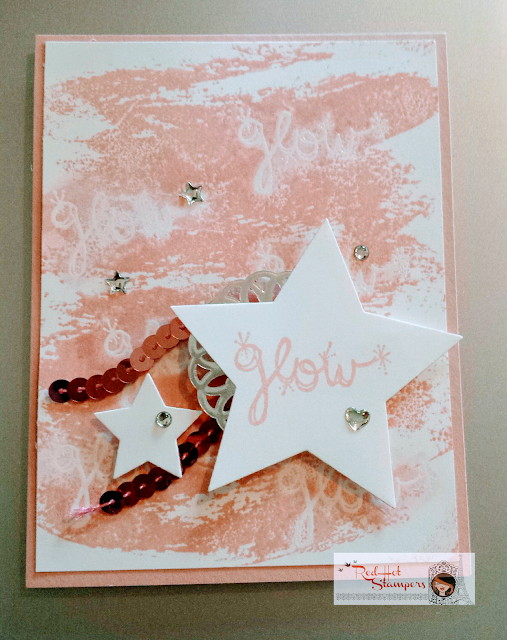 I started off by stamping the "glow" sentiment in Versamark on a Whisper White base. (This stamp is from a set called "Love Sparkles" in the new Occasions catalog!) I sprinkled it with clear embossing powder and used the heat embossing tool to set it. Then I used the Watercolor Wash background stamp with Blushing Bride ink. After I rubbed off the ink on the "glow" images, I softened it by using an Aqua Painter and more Blushing Bride ink. I cut out two star images from the Star Framelits and stamped "glow" in Blushing Bride. I added a little silver doily and then used Dimensionals to pop up the stars AND secure the Blushing Bride sequin trim. The finishing touch was the self-adhesive Metallic Enamel shapes, and then securing the white cardstock onto a Blushing Bride card base. You could make this card in any color, and if there isn't coordinating sequin trim, just use silver or gold!